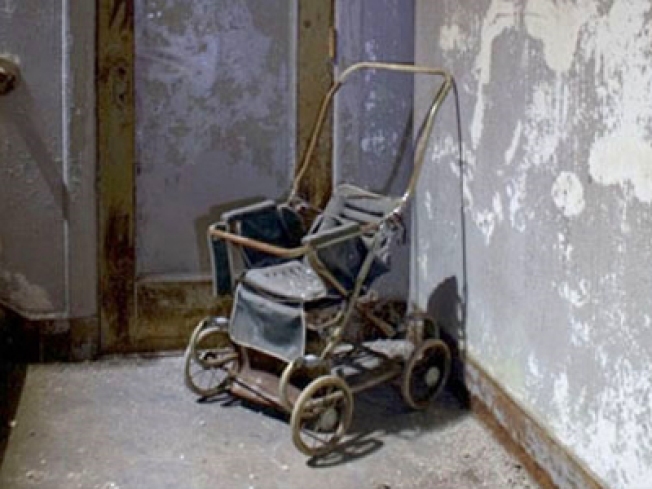 A pram photographed at the Worcester State Hospital -- one of the photos in Clara Daly's exhibit of photos of abandoned hospitals. We have a thing for ruins, and the abandoned buildings featured in Clara Daly's new exhibit Thorazine in the Solarium are no garden-variety ruins. Daly traveled up and down the East Coast, photographing abandoned hospitals, psychiatric wards and mental institutions from Buffalo State Hospital to the quarantine wards at Ellis Island. You can't look at the structures, in their various states of peeled-paint and crumbling decay, and not wonder (and shudder) about the lives of patients who were treated or incarcerated therein. The exhibit runs through March 28, and the opening reception is tonight at 7 p.m., at Williamsburg's Stain.